Imagine having a diamond named after you. Not just any diamond, but one of the world’s most spectacular blue diamonds. 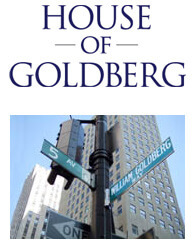 That was the touching honor given to our mother, Lili, by our father, William Goldberg. You see, it was her birthday, and what better gift could a world-renowned jeweler give his wife than to name one of his masterpieces after her? Creating the Blue Lili was a labor of love. The unique rough, which may have been as large as 100 carats, was purchased with a partner in 1980. While we’re not certain of the exact origin of the stone, it is likely to have come from the Premier Mine of South Africa, the only source of significant blue diamonds over the last two centuries. The blue color is caused by the presence of trace quantities of boron in the crystal structure of the diamond. The boron atoms in the crystal change the absorption spectrum of the diamond, producing the blue color. Once the rough was in the hands of our master cutters, an extensive study was made to determine the optimum cut. William Goldberg himself ultimately made the decision to cut and polish it into a tapered, cushion-cut blue diamond with a trapezoid shape. 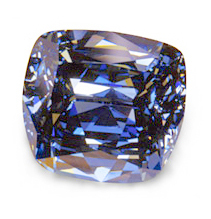 The result was the stunning 30.06-carat Blue Lili diamond. Its Fancy Intense Blue color (most likely graded as Vivid Blue, today), remarkable size and distinctive cut make the Blue Lili one of the rarest blue diamonds in history. The fact that it bears our mother’s name makes it priceless.